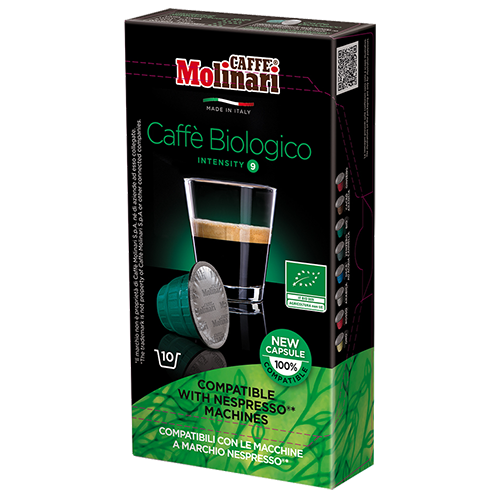 Molinari itespresso Bio 100% Arabica coffee capsules compatible with Nespresso are made from 100% organic fairtrade Arabica beans. The coffee comes from organic farms, mainly from Central and South America and is cultivated according to natural methods. It is this that gives the coffee its unmistakable aroma. The special treatment of the coffee beans and the expertise of qualified importers and the selection of the best coffee in Caffè Molinari's expert team - masters in the art of roasting Italian coffee. All these elements combine to make this one of the best tasting Bio coffees we tried.